Home Property News How to retire in Margaritaville? 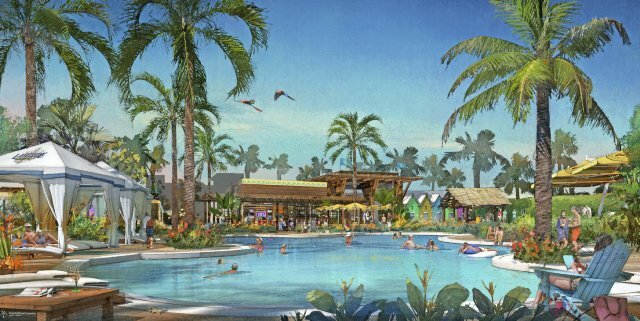 One of rock and rolls longest serving stars Jimmy Buffet is partnering on a new rollout of Margaritaville retirement communities. Jimmy’s brand has already swept though cafes, casinos, hotels, and vacation ownership, so real estate is the next great leap forward. The property venture is a tie-up with Minto Communities and will feature a high concept Town Center hub. Wellness, learning and recreation are key pillars of the townships. Looking at plans the first project is located in Daytona Beach Florida and will open in the latter part of 2017. Minto is a key player in adult active communities which are not only gaining traction is the US but globally as a aging affluent population is being tapped into as a leading real estate platform. One key sign of the times is the shift from a passive to active experience in these type of projects and certainly the core offering of a Town Center resonates towards a more modern approach versus the legacy clubhouse idea and staid old recreation room. Margaritaville’s touch point’s focus on fitness, cuisine and an appreciation towards the arts and learning. Programing in today’s retirement offerings is equal or event more important versus just erecting buildings . Here in Thailand one key real estate offering that has garnered attention is Sunplay on the Eastern Seaboard in Bansaray. While looking at Phuket, market feedback is that a major retirement offering is in the planning stages in a prime West Coast location.